Ph.D. students interested in conducting research in the Department of Molecular Physiology and Biophysics (MPBP) should apply through the Cellular, Molecular and Biomedical Sciences (CMB) Program (application link ). 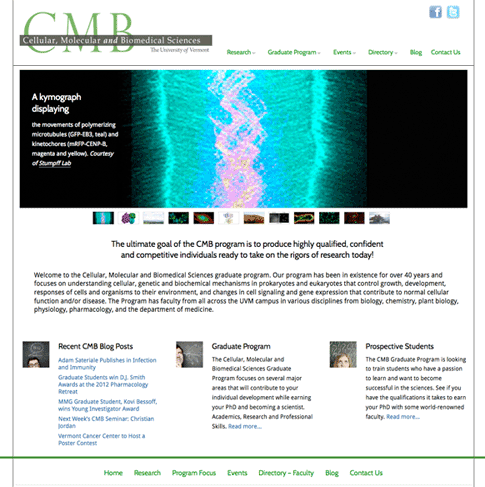 To find out more information about the interdisciplinary CMB Program, visit the “Prospective Students“ page on the CMB website. When Ph.D. candidates join a lab in the MPBP department, they enter a supportive and collaborative environment that encourages innovation. Graduates of the CMB doctoral program have gone on to a variety of positions in academia, research institutions, and industry. For a list of CMB alumni and their current positions, click here.